Metallurgist, president of Força Sindical Bahia, vice-president of ITUC (International Trade Union Confederation). Participated of the foundation of Força Sindical and was the first National Secretary of Women of the Center. We, women workers, who actuated that time, saw that the Brazilian trade union movement did not let in consideration our specific issues, as the correction of different wages. Women made the same work as men in several sectors, but they received smaller wages. It is true that, even being each time more present in the labor market, we still have these claims. But at that moment it was even more serious. Contemplate the women workers was a necessity. And, beyond our claims were not incorporate to the issue of the trade union movement, our participation in the collective negotiations was very small. Then, when it came the idea of founding Força Sindical, we made a meeting that gathered more than three hundred women of several trade unions of Brazil, mainly in the sectors of Clothing, Food, Commerce, Neatness and Conservation, in the Chemical sector, in the Toys Trade Union, beyond many women metallurgists, to discuss which way we would participate of the new institution. The meeting was in February 1991, one month before the foundation of Força Sindical in the head-office of the Workers in Commerce Trade Union, in Cotia (SP). We decided there that we would not only want women in the direction of the Center, as we also wanted that movement, which was beginning, committed to fight in defense of our agenda. In the Congress of March 8, 1991, we took our issue to discuss it with the leaders. This way, Força Sindical resulted of a process of which it participated several women, who engaged in guarantee the commitment with our agenda. One agenda that consisted, in the fight against violence, for bigger opportunities in the labor market, wage equality, against the sexual and moral harassment at work. In the Congress of foundation of Força Sindical, we felt the necessity of improving the preparation of our Secretary. We were tired of organizations that did not answer to the demands of women. Because of this, we gave a bigger time to build the Secretary in a more accurately way. And this was what we made. In September 1991, we made, at Riocentro, RJ, and a Congress with more than one thousand women to create the National Secretary of Women of Força Sindical, from which I was elected First Secretary. It was a very bigger Congress than the meeting we made in February. We constituted the Secretary in national level and we fostered the installation of State Secretaries. During several years we dedicated to the creation and extending of the Secretary. In the first and second mandates, we made partnerships with several Trade Union Centers of the World, and created a Program of Trade Union Formation for women. This way, we had been building a policy for women in Força, in partnership with CLC (Canadian Labor Congress), from Canada, which sponsored a program of formation that prepared women for collective negotiation. For the Third Congress of Força Sindical, in 1997, in the Palace of Worker (district of Liberdade, in São Paulo, we prepared of quotas of, in minimum 30% of women in the State and National directions of Força Sindical. For this we made a campaign with a folder explaining what was and the meaning the quota. We also made a little purple ribbon that we put in people that supported us. When we realized, the big majority of the Congress was with the little purple ribbon. The majority supported us, and the proposal was approved. But it was a fight. (Luiz Antônio de) Medeiros became angry and accused us of wanting to disrupt the Congress. It was something that had big repercussion. Such that the newspapers of the day printed in which headlines: “Women want 30% and break Força Sindical”. Then Medeiros became really angry and called us to talk. But we defended that this was our issue, and we were going to fight for that right. After that, the owner of Folha de S. Paulo said to Medeiros that he wanted to meet me, because, according to him, I was “a strategist”, by achieving to approve, in the Congress of Força Sindical the quota of 30%, something that not even CUT had done. It was a very important and decisive stuff in the history of the Center. When Paulinho (Paulo Pereira da Silva) assumed the Presidency of Força Sindical, in 1999, he gave a much more dynamic and opened dimension to the Center, increasing the perspectives of insertion in society. It is important to remember that, when we found Força Sindical we felt big resistance of other sectors of the trade union movement. They said that we not represented workers, and we were a “Center of bosses”. Do you know that language to destroy? It was difficult to face such entrepreneurs, as other trade union leaders. With the enter of Paulinho these critics lost their focus. In the first years of the Secretary we looked for giving instructions for women for they to participate of the collective negotiations. Our intention was to prepare them to assume positions in the trade unions, enter for the directories and made the trade unions hold their claims in the wage campaigns. This would make possible to work for equality, promotion of posts and careers, professional qualification, opportunities to improve the wages and increase the benefit for children care. We worked these issues in several categories, which started to open table of negotiation with the women. It was something that did not exist until then. The issue was always focused in the big themes, as wage increase. We looked for to incorporate to these general campaigns what we called “Issue of women”, in a way that we did not make a segmented fight, but attached to the banners of the Center. This way, actions as the fight for the valorization of the minimum wage, for the workload reduction, for the combat to unemployment, and for development with income distribution, which Força Sindical develops, also attend to women. This because, according to indicators of IBGE, they suffer more with poverty and unemployment, and have the lower wages. And that, in counterpart, heads one third of the Brazilian families. When we can improve the income distribution and the minimum wage, a huge quota of women is benefited. Today we have much more women in front of institutions as Trade Unions and Federations. We not only have more Secretaries of Women in several Trade Unions and Federations of Força, just as there are more women in the Executive Directions of these institutions. 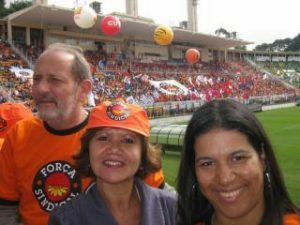 The current president of the National Confederation of Metallurgists Workers (CNTM), for example, is a woman, Mônica. ILO (International Labor Organization), being an institution of the United Nations, has three parts representation – of government, employers and workers. I represented workers of Brazil in the last mandate, but now it will have another election. The biggest reference of ILO are the International Conventions, to which the Countries may accede. From eight Conventions of the fundamental rights of workers, Brazil already ratified seven. It did not sign only the Convention 87, which is just about trade union freedom. But it ratified the Conventions that deal of wage equality, against children work, against forced work, the Convention of the collective negotiation of the public server. To sum up, Brazil signed the main Conventions, which made us an important international reference. The fact that having not ratified the Convention 87 is only because the lack of unit among employers and their workers. And if Brazil decide to adopt this Convention about trade union freedom, it will be necessary to change the Brazilian Constitution in its article 5th. The fight for the political participation of women started for decades, with the achievement of the feminine vote in 1932. But we advanced slowly. In the elections of 2006 and 2010, we elected the same number of deputies, only 45. We do not represent neither 10% of the 513 parliamentarians. In the Senate, it is a little more. Because of this, we need the law of quotes. The election of Dilma Rousseff demystifies the prejudice of five hundred years of which women do not match with politics, showing that we are prepared to exercise the power in its higher degree. Dilma already is the 11th woman elected president in Latin America. Only in Argentina, two women already achieved the presidency: Isabelita (3) and Cristina (4). This way, I think that the victory of Dilma has great symbolism. And, more than this, Dilma brings a typical concern of who understands the difficulties of women, as the responsibility with the children. The reality is that the fathers do not want to know if the child is small, two or three years or six months. In general, it do not change anything in their life. And for us, women, do not have where let the children is a very serious problem. Dilma just reaffirmed this commitment releasing a program for pregnant women, which was promise of campaign Stork Network. The program benefits women exposed to badly done prenatal, to mother mortality, lack of support, lack of children care. Because of this I believe that she will provide a qualitative leap in women life. Dilma also may advance in other of our banners. With the pen in her hand, she has conditions of press the State and guarantee better conditions for women. Our hope is that she is able to make this difference, open this space and show that we may participate of politics. We have good perspectives in terms of growth of women in our Country. And not only with the participation in the labor market. The ideal would to reach to 50% of women in the parliament, in the city council chambers, in the city halls, and we have a society with more equality and equity. If we had this, all the society will be well, and the Country will be more advanced. I see the case of Iceland, with a lot of women at the parliament, a woman as First Minister, the responsibilities shared, men dividing the familiar tasks. It is a happier people, a good example. (1) Otávio Frias de Oliveira (1912-2007) was a Brazilian journalist and entrepreneur, proprietary of the conglomerate Folha da Manhã, company that edits the diary Folha de S. Paulo, the newspaper Agora, the internet portal Universo Online (UOL), the Data Folha Institute, the editor Publifolha, the graphic Plural and the economic diary Valor, in conjunct with the Globo Organizations. (2) Mônica Oliveira Lourenço Veloso, Secretary-General of the Metallurgists Trade Union of Osasco, and member of the executive direction of Força Sindical, assumed the Presidency of CNTM in May 2011. (3) María Estela Martinez, known as Isabelita Perón, was the first woman to occupy the Presidency of the Argentina Republic, in 1974, after the death of her husband Juan Domingo Perón (she was the third wife of Perón), elected by a plate called Perón-Perón (Juan President, Isabelita Vice). In March 24, 1976, Isabelita was ousted by the military dictatorship. (4) Cristina Kirchner was president of Argentina.